In cockpit conditions or in cabin zone, SELA supplies a full range of Emergency and Floor lighting systems. Our LED dome lights in ceiling are equipped with a 28 V center main ambient lighting and a second input in 6 VDC is designed to the emergency lighting. The same connector in the back side of the dome light includes two 28 V inputs (Ambient center lighting and back up lighting) and one 6 VDC input is dedicated to emergency lighting. The SELA dome lights are compliant with FAR 25 standard. If only a 6VDC emergency lighting is required, SELA proposes its fix LED spot lights for any area (cabin, flight deck, cargo…). We have designed a complete range of back lighted panels installed over instruments and indicators for light helicopters cockpit. If emergency conditions are required, the pilots can switch the SELA complete cockpit panel to 6 VDC emergency lighting, since already integrated within SELA products. Regarding floor illumination, a full range of SELA fix LED small point lights in 6 VDC, 12 VDC, 28 VDC or 28 VAC, is available. Compared to a traditional floor path marking, the installation of this kind of small light fixtures is simplified by the mean of either a simple nut or an insert that allows an easy removal by the front face. 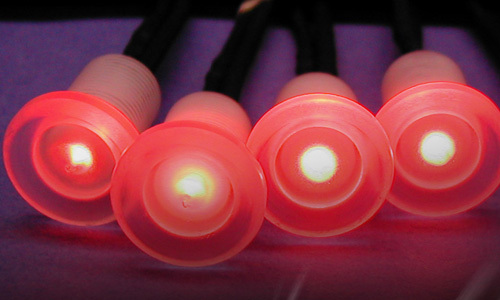 Our small LED point lights are available in several LED lighting colors: white, red, green, amber and yellow. Marking options are also proposed (arrow for direction indication). Our floor path lights product line is also composed of small rectangular modules including 6 VDC and 28 VDC inputs, managing at the same time emergency and comfort lighting with white and red lenses. Feel free to contact us for any requirement.